-The bowl is decorated in cobalt blue to the interior with a central roundel enclosing a dragon.The exterior is further painted with two dragons chasing a flaming pearl amidst clouds and a Chinese daoguang seal mark, 19th century. -The blue and white porcelain censer, decorated in underglaze blue with two four-clawed dragons chasing the flaming pearl. 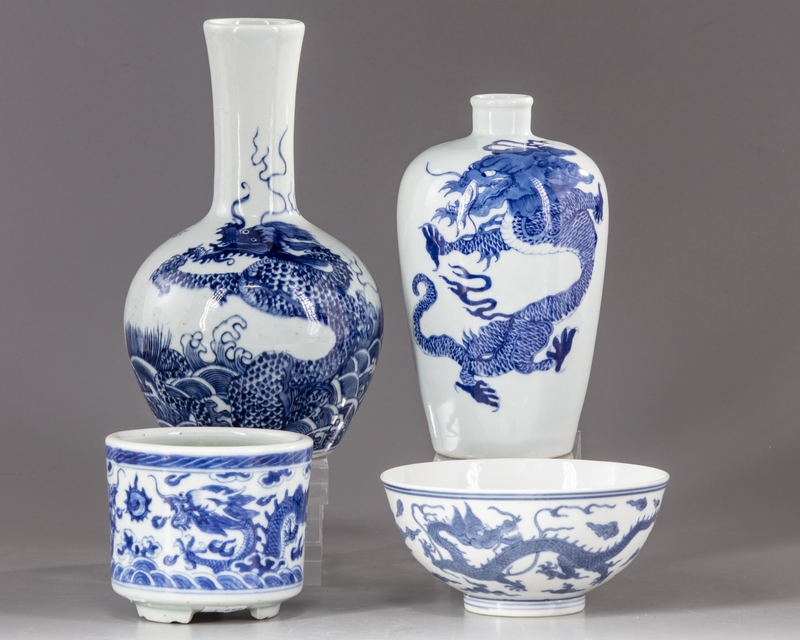 - A blue and white ‘dragon’ vase, meiping. The squat meiping is decorated to each side in bright cobalt blue with two large sinuous five-clawed dragons with a fierce expression on their faces. The vase 22.50 CM. high. The bowl 7.00 CM. high, 14.50 CM. diameter. The censer 9.00 CM. high, 10.50 CM. diameter.